This entry was posted in Uncategorized and tagged bipolar, bipolar disorder, mental illness, statistics. Bookmark the permalink. Yes that is true it took after my first bipolar episode after my daughter was born to be Dx with bipolar effective disorder 15 yrs.. They Dx usually the second full manic episode.. This is great information; thanks for sharing! where did these stats come from. they scare me. You can find the source by clicking on the number after the statistic/fact. Excellent statists. I’ll save this for sure. 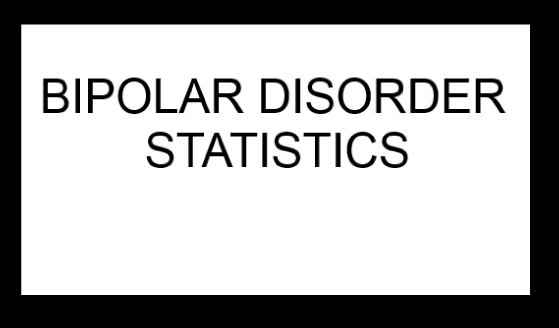 But I was wondering if you might feel up to reporting in these statistics the number of people who have psychoses as symptoms of their bipolar disorder as well as stats on the number who also have impaired insight or anosognosia. A startling number of children have it. Such a shame. Another eye opening blog from Amy! Share with other suffering so that they don’t feel so alone and are educated about this disease. I think it’s difficult to get diagnosed with the disorder. What if your family seems like they all have it and self diagnosis is not the answer to your problem/questions. It helps me to understand the high impact of BIPO in society.